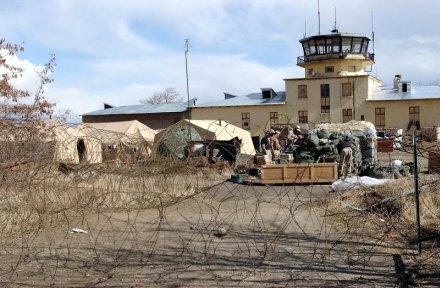 The US military has decided to hand control of controversial Bagram prison housing more than 3,000 Taliban fighters and terrorism suspects to the Afghan authorities. In a small ceremony, Afghan officials said inmates had been transferred to their authority. The move is part of a deal to transfer all Afghan prisons back to local control ahead of the withdrawal of NATO forces at the end of 2014. Bagram prison has been at the centre of a number of prisoner abuse allegations. Although Afghan President Hamid Karzai has hailed the planned handover, disagreements with the US remain. Washington is insisting that it will maintain control over some detainees in the prison. The handover took place in a brief ceremony which correspondents say was poorly attended by US and NATO officers. “I’m happy that today we are witnessing a glorious ceremony that marks the handing over of responsibilities of Afghan prisoners to Afghans themselves,” said acting Defence Minister Enayatullah Nazari, quoted by AFP news agency. Now officially known as the Parwan Detention Centre, Bagram prison lies about 40 km (25 miles) north of the capital, Kabul. It was once located in one of the largest military bases for NATO-led forces in Afghanistan, but the new Parwan facility was constructed a few miles away in 2010. More than 3,000 inmates are held there, including about 50 foreigners not covered by the handover agreement signed in March. The US military still wants to run a section of the jail and is not handing over some detainees, saying it has the right to hold insurgents caught on the battlefield. Privately, the US is concerned that some high-value inmates could be released if they are handed over, our correspondent says. That has angered President Hamid Karzai, who says that full Afghan control is an issue of sovereignty. Bagram has been described as “Afghanistan’s Guantanamo” for its troubled past of prisoner abuse and indefinite detention. In April 2010, a media investigation uncovered allegations of prisoner abuse at a hidden facility at Bagram. The US military denied it was operating a secret jail. In January 2012, Afghan investigators accused the US Army of abusing detainees at Bagram. The investigators said prisoners had reported being tortured, held without evidence and subjected to humiliating body searches. The following month, US soldiers burned Korans at Bagram, leading to days of protests and targeted killings across Afghanistan. A US investigation said there was no malicious intent to disrespect Islam.